恐れ入りますが、このホテルに関する詳細はまだ日本語に訳されていません。 Though essentially a weekend escape from Auckland, the Oyster Inn is the sort of place that, frankly, we’d fly any distance to visit, a three-room inn and a destination restaurant on an idyllic little island in Oneroa Bay, as effortlessly cool and painstakingly plush a hotel as we’ve come across in a long time. What’s more, it’s clearly a labor of love. 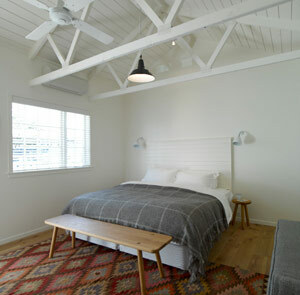 Owners Andrew Glenn and Jonathan Rutherfurd Best, former London fashion and entertainment executives, have slathered the place with equal measures of charm and fresh white paint — not to put too fine a point on it, but there’s a lot of white paint. By the time you arrive, you’re already drunk on sea air. It’s a forty-minute ferry ride from Auckland to the island, a trip that inevitably induces wind-blown selfies and breaths so deep they begin to turn into yawns. Waiting for you at the marina is a sunflower-yellow 1970s VW van, ready to take you the last few minutes to the hotel, where (here’s the kicker) life only gets breezier. Stepping into a guest room, what appears at first to be designed primarily as a balm to the eye — a wash of white, pared down to sunlight, space, a few pieces of elegant rough-hewn furniture and some lightly applied artwork — turns out to have something in store for all the senses. The super-king bed hits the trifecta of crisp (high-end sheeting), cushy (goose down pillows), and cozy (super-soft Merino wool throws). The usual analogy, “cloud-like,” is too mundane to capture it. All the usual luxury hotel amenities are accounted for — from white waffle robes to Aesop bath amenities to iPod docks and big, flat screens — but it’s just as much the little things that count. 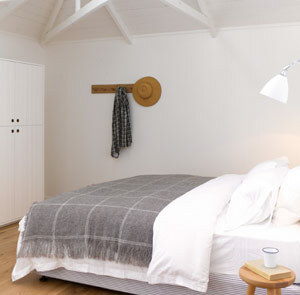 Things like those dewy milk jugs chilling your water in the fridge, the under-floor heating keeping your toes warm, or the option of some late-morning passionfruit pavlova or late-night egg truffle toast delivered to your room. Of course to stay at the Oyster Inn and miss out on the restaurant would be an act of supreme foolishness. The restaurant at this three-room hotel has eighty seats, which says something about how much they need a captive audience of hotel guests to prop the place up (not at all). In summer, the best spots are on the veranda overlooking the bay, where to eat fresh-shucked local oysters and drink cold New Zealand white wine is to wonder what more one could possibly need to live. Every dish is a refined take on something soul-warmingly homey: flaky fish pie; a clam chowder that’s as much about cream and bacon as clams; the fish of the day, pan-fried and served in a mussel-and-crayfish bisque…. It goes on like this — and somewhere beyond the walls, we’re told, there’s actually a whole island, covered in vineyards, available to explore. 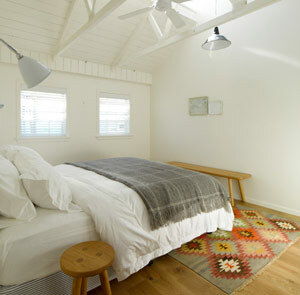 The Oyster Inn is located on Waiheke Island, a 40-minute ferry ride from central Auckland. The hotel operates a free shuttle service between the island’s Matiatia Wharf ferry terminal and the property.